UK: Vattenfall has installed the first suction-bucket jacket foundation at its 11-turbine European Offshore Wind Deployment Centre (EOWDC) off the east cost of Scotland. 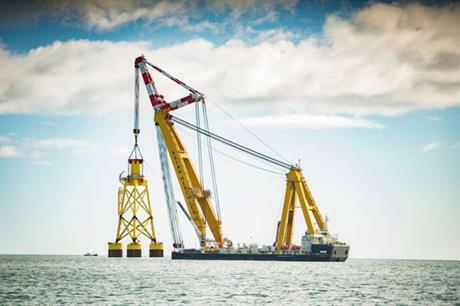 Boskalis’ 25,000-tonne Asian Hercules III vessel, which has a lifting capacity of 5,000 tonnes, took 15 hours to install the 1,800-tonne structure, Vattenfall stated. The £300 million (€343 million) EOWDC project is the first to use the foundations for turbines on a commercial scale, the Swedish developer added. Suction-bucket foundations create a vacuum to secure them to the seabed, removing the need for driving monopiles. The technology has previously been used for the substation at the 402MW Dudgeon project off the east coast of England, and in prototype form for one turbine at Ørsted’s Borkum Riffgrund project in the German North Sea, but not on a wider scale. Adam Ezzamel, Vattenfall’s project director for the EOWDC, described the installation as a "major accomplishment". He explained: "Suction-bucket jacket foundations — which can each be installed with a single offshore lift, virtually without noise and within a matter of hours — bring considerable environmental benefits. "They are lowered into the water where the upturned buckets are rapidly embedded into the seabed to create a secure foundation for installation of the turbines." When completed later this year, the 92.4MW project will be Scotland’s largest offshore test and demonstration facility. It will comprise 11 of MHI Vestas’ V164-8MW turbines, upgraded to an 8.4MW capacity, which will be connected to the shore via a 66kV cabling system. The EOWDC is due online this year after a series of setbacks, mostly due to legal challenges brought by US President Donald Trump, which caused two years of delays. The project will be visible from one of Trump’s 17 golf courses.